No-bake breakfast bars make the perfect on-the-go balanced meal for kids and adults! 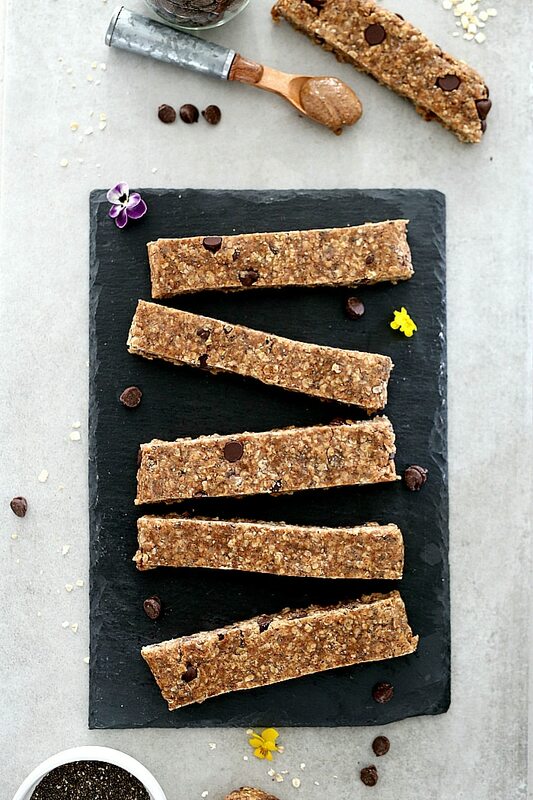 These incredibly easy homemade granola bars take little time to make and are made with wholesome oats, almond butter and no refined sugars. 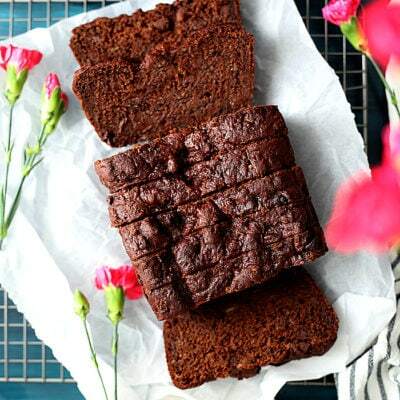 An addictive gluten free treat you will want to nibble on to energize all day long! Do you stroll through the grocery store aisles and all your kids want to eat are the granola bars and cereal bars lined up beautifully stack by stack? The funny thing is (ok not so funny when they holla for another bar), but they want one bar after another bar, after another one, after another one until you notice you just spent $5.99 on a box of granola bars that your one child just devoured as a snack. That has happened one too many times to the point I just make my own no bake breakfast bars that the kids (and now your family) can enjoy without the parent guilt of the price tag or consuming a whole box of processed goodness. Really, how do the manufactures get those granola bars to last for months on end? 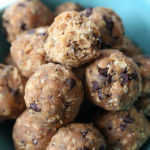 We love no bake everything including these famous no bake protein energy balls. 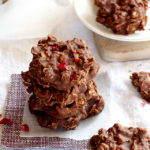 No-bake snacks just make life easier, right? Just as much as the famous “CLIF Kid” bars that my kids just adore. These homemade no bake breakfast bars taste just like those well adored CLIF Kid bars and now you can enjoy them from your own kitchen! Do you get as excited about that as I do, or is that just a foodie blogger thing… :-). Here is a secret I will share with you… these homemade no bake breakfast bars taste ultra chewy, sweet, and pleasantly comforting. What makes these no bake breakfast bars chewy? Short answer, almond butter. Long answer, almond butter. 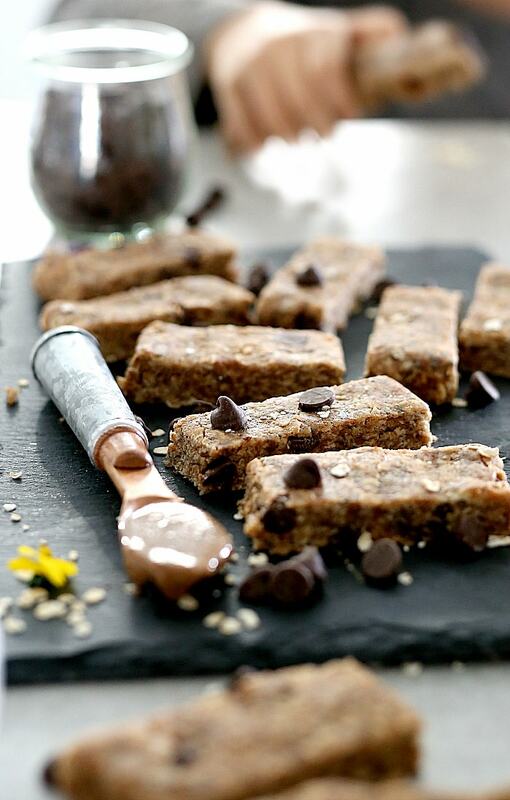 Almond butter just makes these bars fantastic! 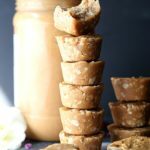 Almond butter is thick and creamy and when mixed with maple syrup or honey gives these bars a mouthwatering sugary chewy consistency that soothes a sweet tooth. Soak that sweetness in oats and you have an even creamier consistency made of wholesome fiber-rich ingredients! 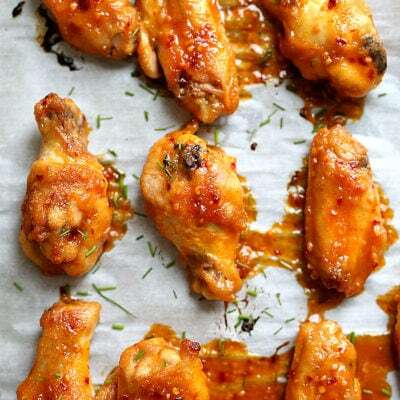 Promise you will want to eat the whole pan as soon as they are ready. 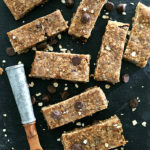 These homemade breakfast granola bars taste like cookie dough! 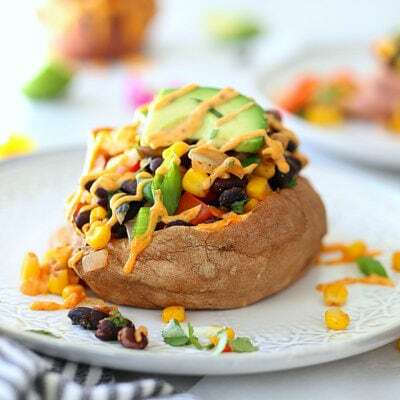 They are a natural energizer to refuel kids before a sports game, in the morning or served as a dessert treat after dinner! On busy school mornings this is what we grab-to-go for breakfast. 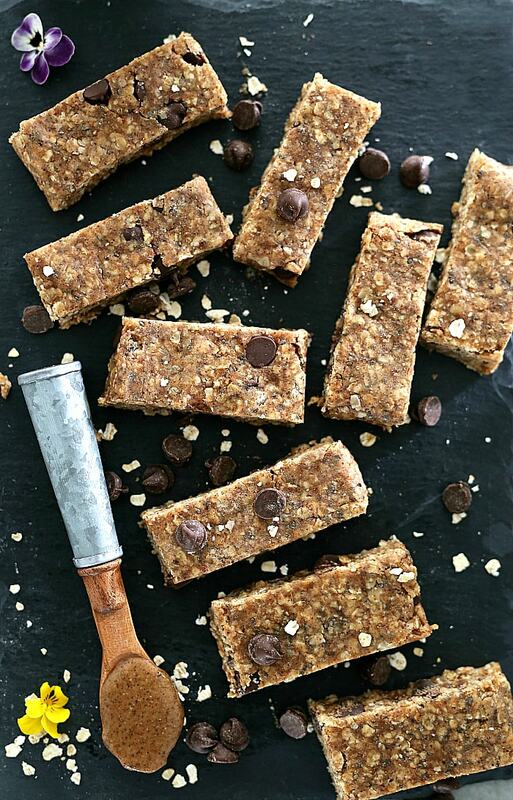 These no bake breakfast bars are also a great way to add healthy carbs, plant-based protein, omegas, fiber and and B-vitamins into the start of your morning! 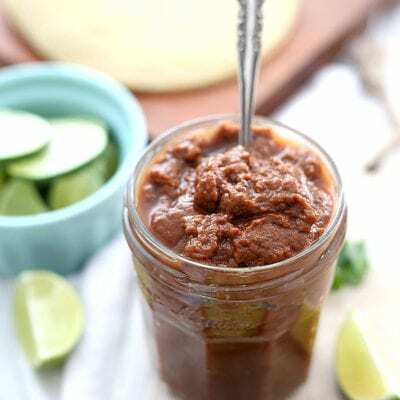 Place almond butter and maple syrup in a bowl. Microwave if needed for 30 seconds to soften. Whisk together until smooth. 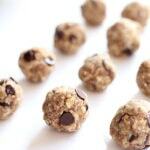 Add the oats, gluten-free flour, 1 tablespoon apple juice, cinnamon, vanilla, chocolate chips and a dash of salt. Mix well to coat everything. May need to knead with your hands until oats are fully absorbed with all ingredients (add 1 or more tablespoons of apple juice if needed). On a flat surface, place parchment paper down and then place your "dough" on the paper. Add another sheet of parchment paper on top. Roll out dough into a square shape until about 1/2 inch thick. 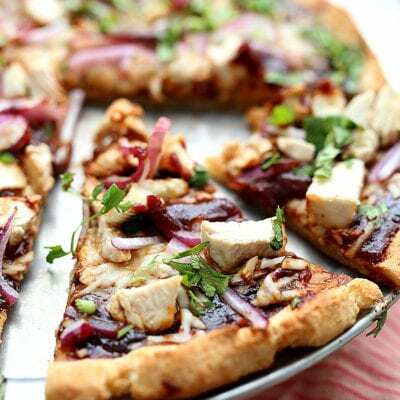 Place in refrigerator for about 30 minutes or more or in the freezer for 15 minutes. Remove pan from refrigerator and slice into about 6 horizontal strips, then half each of those strips. 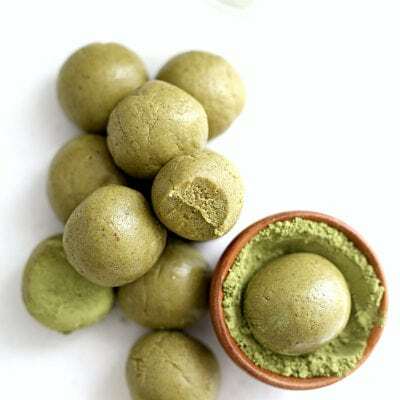 Store in parchment paper placed in an airtight container in a glass container and stored in the refrigerator. Consume within 5-7 days. 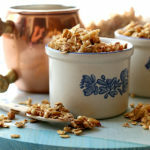 Pin These Easy No Bake Breakfast Granola Bars! I totally need to try these for my kids. I love how you can control the sugar because all those granola bars and cereal bars have way too much. Thanks for sharing!